Let's face it, lighting is difficult to learn and, once learned, cumbersome to perform. Interior designers, architects, kitchen and bath designers want to take control of their lighting plans, but don't always have the necessary technical lighting background, not to mention the time to perform the tedious calculations. LightCalc was created to solve these problems. No longer is it necessary to know any of the math! The program works with information the designer has ready access to; ceiling height, room width and length, counter height, color pallette, etc. Upon entering the above type of information, LightCalc goes to work determining the appropriate footcandle level, fixture spacing, and it will suggest a ceiling layout for your fixtures. Designers will enjoy the point and click method and the visual display of what the light is doing. 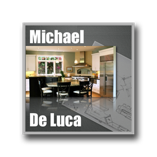 The program was written by Michael De Luca, ASID, CKD, NCIDQ for interior designers and architects, knowing what is important to them and what types of information they normally will have at hand. LightCalc is fun, yet accurate to use, and a superb tool to show the client the effects of the lighting plan while still on the drawing board. Determines the overall reflectance in the room. Finds the proper footcandle level for general, task, and art lighting. Adjust the footcandle level for dark to light rooms and client age. Determines the proper spacing needed. Uses both Inverse Square Law and Lumen methods. Suggests a grid layout for general lighting. Art Lighting - See the light right on artwork! 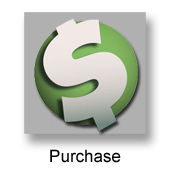 Enviro-Systems has worked hard to provide you with a tool that works the way you do, visually, while saving you the one thing you need most... time. If you are ready to design lighting for your projects with confidence and ease, order LightCalc today! Probably the most important method when it comes to directional lighting (i.e., flood, spot, PAR, MR16, etc.) is the Inverse Square Law. LightCalc makes its use a snap. The designer simply enters the room and counter heights and the program instantly provides the candlepower necessary to provide the desired footcandle level. Enter the beam angle of the lamp you want to use and LightCalc creates a section view of the cones of light correctly spaced and dimensioned. Change the ceiling height and the cones of light are redrawn and redimensioned for you. and the candlepower recalculated. You can insert a section of cabinetry and the cones of light are shifted and redimensioned to prevent unsightly scallops and shadows. 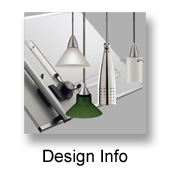 You won't believe how easy it is to determine the appropriate fixtures and lamps with LightCalc!! LightCalc will compare lamps at various heights, footcandle levels and lamp candlepower. Sometimes it is necessary to drop the lamps from the ceilings; islands, vaulted ceilings, etc. LightCalc allows the designer to set the ceiling at any height and drop the lamps to any height above the workplane (counter). LightCalc will dimension and do all the calculations as in the "Directional Lamp Selection & Spacing" section above. 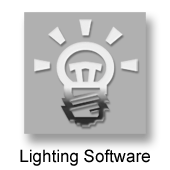 For fluorescent and compact fluorescent lamps, LightCalc will determine the number of lamps needed and their spacing using the Lumen Method (a cumbersome trial and error method by hand). The program will even suggest a ceiling layout so you can get a fast start on your reflected ceiling plan. Trying to predetermine the amount of coverage on a piece of artwork has always been hit and miss. With LightCalc, the designer sizes and places the artwork on the wall, places the lamp any dimension out from the wall and LightCalc will draw the ellipse of light created by one or multiple lamps. All necessary dimensions are given. Change the beam angle and the ellipse changes instantly to preview the change. Footcandles and the candlepower necessary are given at every change. 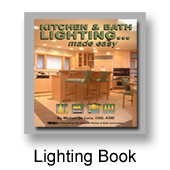 If you have the book, "Kitchen & Bath Lighting... made easy,"
the new art window is like Chapter 7 on steroids! Finally, the visually oriented designer can see what they are actually going to get prior to installation. Light reflecting from the materials and colors in a room adds to the illumination provided by the lamps. The darker the colors in the room, the more powerful the lamps need to be to provide the necessary illumination (footcandle level). You simply click the colors found in the room and LightCalc will calculate the overall reflectance and automatically adjust the footcandle level. If the colors have not been selected, LightCalc will assume an appropriate average. The appropriate light level will be different for various tasks. It takes more light to thread a needle than to have a conversation for example. The IES has set recommended levels for these tasks and the rooms in which they occur. LightCalc determines the correct lighting level for any room and any activity by simply clicking on a room (kitchen, bath, office, etc.) or activity (sewing, reading, painting, etc.). If the designer has identified the colors to be used in the room, LightCalc adjusts for the reflectance and provides the footcandle level for general, task and art. For universal design purposes, LightCalc adjusts for clients over 55 years of age who require more light. Of course, the lighting designer may override this feature if desired. Lux to FootCandle Conversion LightCalc allows the designer to quickly convert from Lux to FootCandles and back again. If you have ever used european light fixtures, you will realize how much time this can save. Manufacturers of such fixtures are: Hafele, Hera, Hettich, etc. The "Art", "General & Task ", "Pendant" , and "Vaulted Ceilings" features are all based on the Inverse Square Law. When the lamp is moved up or down, the candlepower necessary to provide the desired FootCandle level is automatically recalculated so the appropriate lamp can be selected. an overview of lighting concepts as an aid in learning the program and lighting theory. a glossary of lighting terms defined in easy to understand language. a convenient listing of fluorescent and incandescent lamps which can be used with Inverse Square Law calculations. fixture efficiency tables (CU) for use with the Lumen Method.